Setting an agenda against the Modi government ahead of the 2019 elections, lakhs of farmers reach Delhi for march to Parliament on Friday. The very essence of this sentiment is shared by lakhs of other farmers, who, like Prasad, travelled across the length and breadth of the country to make their voices heard. The farmers have reached the national capital and are congregating at four major points of Delhi and are gearing up to flood Parliament street tomorrow. The historic march is setting an agenda against the Modi government ahead of the 2019 elections, Under the BJP government, farmers protests have witnessed a significant increase. Starting with the massive struggle for protection of land rights and against unjust land acquisition within a year of the formation of the Modi government, the movements of farmers have burst out repeatedly in several states, mostly on the twin issues of low prices for produce and consequent indebtedness. Highlighting the plight of her debt, Sushila Devi, showed Newsclick her wounds from regular scuffles with the moneylenders. 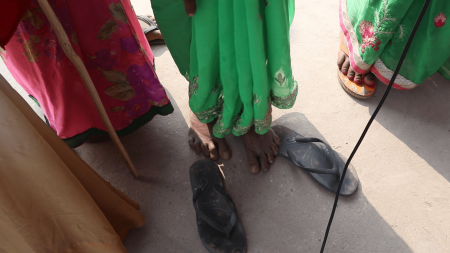 She said,“As a wage worker, I get regularly beaten up, they wreck my home and demand that I pay up the dues by hook or by crook.” Sushila has taken a loan worth Rs 50,000 after she failed to receive the desired MSP (minimum support price) for her crops. Crumbling under increased agrarian distress which has led to over three lakh farmer suicides and ruination of many more, the farmers through the symbolic march are hoping to break free from the vortex of poverty, debt and political apathy. 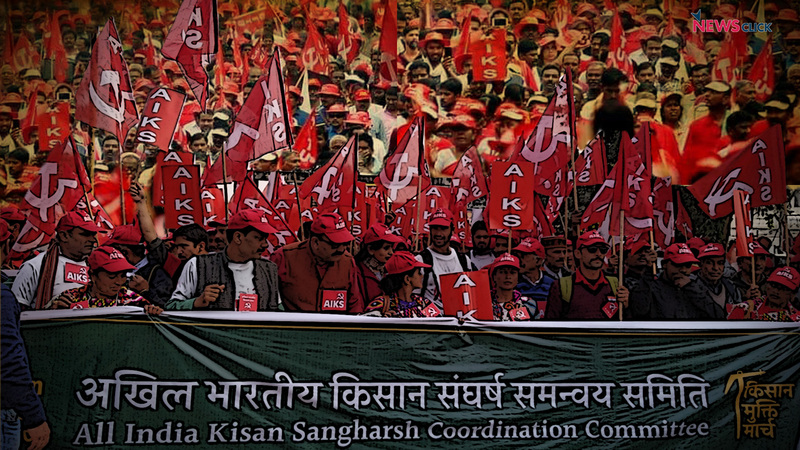 The cause of the farmers is being led by an umbrella body, All Indian Kisan Coordination Committee, which includes All India Kisan Sabha (AIKS), Swaraj Abhiyan, Swabhimani Shetkari Sangathana, and is supported by over 208 organisations across the country, including workers, students, artistes. In the expression of unity the farmers collectively expressed their resentment towards the BJP government. Rakesh Yadav a farmer from Fatehpur, Uttar Pradesh said, ‘Hum sab kisan Modiji ke virodh main aaye hain, Modi apne saare vaadon ko lekar viphal rahe hain, ye kisanon ka jan saelab Modi ke khilaaf umad raha hai, ye iss baat ka saboot hai, ki desh ka kisan poori tarah se toot chuka hai. 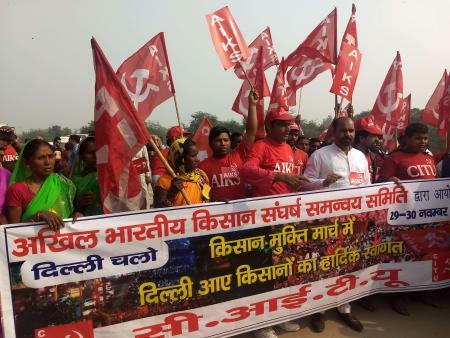 The Kisan Mukti March is witnessing enormous participation from farmers across the country, whose main demand is that a 21-day special session of Parliament be called to discuss the agrarian crisis. The special session should discuss and pass the two Bills prepared by a Kisan Parliament last year to ensure liberation from debt and assured remunerative prices. Two Bills have been introduced as private member bills in Parliament by K.K. Raghesh, a CPI(M) MP and Joint Secretary of AIKS in Rajya Sabha, and by Raju Shetti, MP from Maharashtra in the Lok Sabha and leader of the Swabhiman Shetkari Sangathana. The farmers have also been demanding the implementation of the recommendations of the MS Swaminathan Commission.